I seem to make the same cocao date bliss ball combo week in and week out. This week it was time for a change. 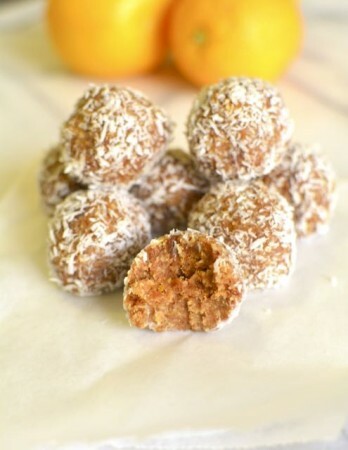 I found inspiration online for citrus based bliss balls and the result are these Orange Oat Bliss Balls. These Orange Oat Bliss Balls are a refreshing change to our usual bliss ball, they are lighter in taste and deliciously soft and gooey. If you are looking for something fresh, then this might just be the recipe for you. This batch of Orange Oat Bliss Balls are straight from the kitchen, and this batch I used oats so that they met the nut free requirements of school. If you didn’t need a nut free bliss ball I would substitute the oats for cashews. This would make them a great protein bliss ball. I also take the opportunity to boost the nutrient content of these for the kids by adding a few spoonfuls of probiotic powder. This is especially great if you struggle to get your children to take powders. If you wanted to boost the protein content for the kids, you can add a few spoonfuls of whey or plant based protein powder. This way they will get the protein that gets desperately need, yet will still be school lunch box approved. Whatever way you make these bliss balls, I hope you enjoy them as much as we do. Place all the ingredients into the food processor and blend until it forms a smooth dough.